LONDON — The rioting and looting that convulsed poorer sections of London over the weekend spread Monday to at least eight new districts in the metropolitan area and broke out for the first time in Britain’s second-largest city, Birmingham, in what was developing into the worst outbreak of social unrest in Britain in 25 years. Despite going its own way 234 years ago, in some ways the brash young outsized scion that is the United States continues to follow in the footsteps, down the same garden path, of its aging progenitor, the United Kingdom. Specifically, since before the financial collapse of 2008, England has been dealing with the basic fiscal problem at the root of the current global convolutions – spending more than you’ve got coming in, followed by visits to some sort of street financing, payday loans, followed by organized thugs dedicated to illicit enrichment who take vows of silence and colorful names like The Cheese Man or Fannie Mae. Even before the outbreak of violence, the police have been deeply demoralized by the government’s plan to cut about 9,000 of about 35,000 officers and by allegations that it badly mishandled protests against the government’s austerity program last winter and failed to properly investigate the phone-hacking scandal that has dominated the headlines here for much of the summer. Britain was ahead of the curve in getting tough in government spending,slashing its budget in many of the areas about to be snipped across the Atlantic; education, social services, jobs programs, local government. Today, across this weary and worn world financial capital, the smoking ruins of working class neighborhoods stand in eloquent testimony to the effects of depriving angry adolescents of purchasing power now or even the hope of things getting better in the future. The police are being outmanned and outmanuevered, and if this thing continues to spread a military intervention may be inevitable. Despite an additional build-up in the number of riot police officers, many of them rushed to London from areas around the country, gangs of hooded young people appeared to be outmaneuvering the police for the third successive night. Communicating via BlackBerry instant-message technology that the police have struggled to monitor, as well as by social networking sites like Facebook and Twitter, they repeatedly signaled fresh target areas to those caught up in the mayhem. They coupled their grasp of digital technology with the ability to race through London’s clogged traffic on bicycles and mopeds, creating what amounted to flying squads that switched from one scene to another in the London districts of Hackney, Lewisham, Clapham, Peckham, Croydon, Woolwich and Enfield, among others — and even, late on Monday night, at least minor outbreaks in the mainly upscale neighborhoods of Notting Hill and Camden. Wild, out of control youths, with nothing to lose, running rampant through the streets of London. Not really protesting anything, just pissed off and full of hormones and in the grip of a desperate, liberating mania, a spasm of destruction and acquisition. They are not out to make a political point, or to confront the police in a macho mano-a-mano. The are into old-fashioned smash and grab, as much for the smash as for the grab, but the first shops looted were cell phone and electronic stores. Of course, eventually they took out whole blocks, stripping stores and torching the scene of the crimes. Sitting in his swanky flat in Chelsea, the Dowbrigades briefly debates visiting the scenes of some of last night’s rioting. From curiosity, as a citizen journalist, for old times sakes. But we aren’t quite as spry as when we were on the other side of the barricades, and we promised the wife to try to snag half-priced tickets to Billy Elliot in Leichester Square after class. We only have another week before the U calls us back to Boston for the fall semester. 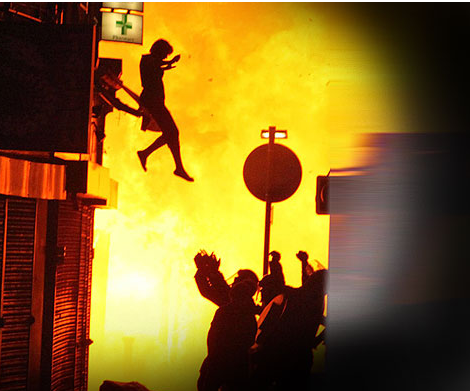 Will the rioting continue? Will this same miasma of want and need spread to the States, fueled as here by the stark contrast between the obscene opulence of store windows and almost everyone featured on TV and the grinding hopeless struggle of everyday life in immigrant and minority neighborhoods? Will the United States follow her emminent predecessor into eccentric and doddering decline as the ex-richest and most powerful Empire in the world? A once-was, last millenium museum of freaks and performers, isn’t-it-a-shame Celebrity Rebab candidate, a la ex-heavyweights Rome, Egypt and Greece, or Babylonia (aka Iraq)? Hardly slept last night, watching shops and cars burn across London and financial markets fall across the globe. These are the news days we live for. Fiction can’t compete. Stay tuned……..